Storyboarding is part of the design process. The DESIGN process. In the elearning industry there are a lot of authoring tools from the rapid family to those that require skills in programming languages. I run a company that develops primarily in rapid tools, but I don’t develop rapid elearning and I don’t design in those tools. Design is a process. A process that starts with a pencil. Period. PowerPoint gets a bad rap and has been the punch line of many jokes. And rightly so. That’s because really bad designs developed in PowerPoint is due to, “Oh look! I can do this cool thing” on a whim. Those whims add up until there is no consistency, no balance, no DESIGN. PowerPoint is an authoring tool. A development environment. PowerPoint has a really good feature set of tools to create attractive designs and is a capable graphics editor. The problem lies in folks who start the design process within the development arena whether that be in PowerPoint or any other authoring tool. Stop it! 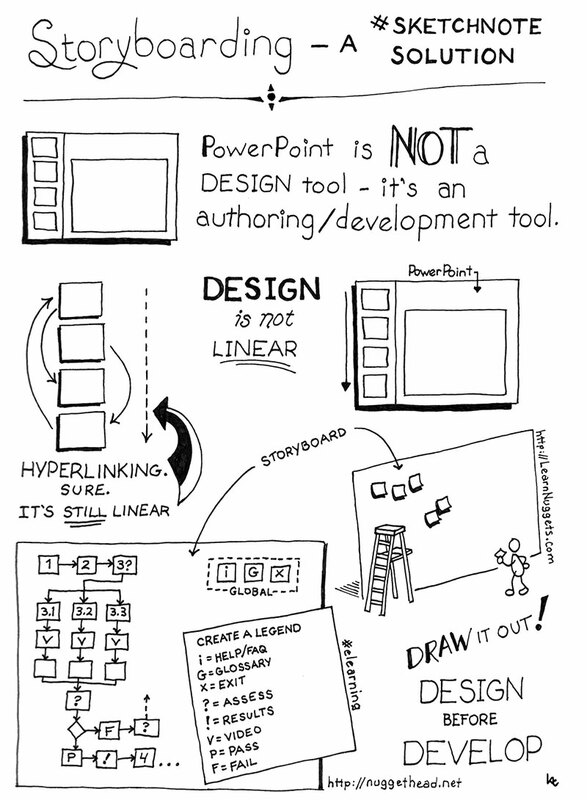 Have you ever used mindmapping tools for storyboarding? Hi Julio! Yes, I have used/use mindmapping tools. But I *always* start with a pencil. What’s your favorite mindmapping tool that you use? Fully agree with the benefit of the freedom of paper/pen. I like the legend it could serve as a check list as well. Hey Bruno, Storyboarding in itself is a style. Meaning, whatever style whether that be UML convention, pencil/paper, mindmapping software, or any other form is totally up to the designer. This is more about the importance of storyboarding or some level of initial design *before* developing.